Superman won't wonder what life would have brought him on Krypton, now that his wife, sister, daughter, and destiny have been revealed. Depending on one's personality or imagination (or amount of free time) most Superman fans have asked the same questions. What if Krypton hadn't exploded, or went on living for a few more centuries? Not in terms of what Earth would miss out on without Superman protecting the skies... but what life would have been made by Kal-El, son of Jor-El, head of one of Krypton's most famous families? Thankfully, Action Comics #994 sets out to put that very issue to rest, albeit in the most heartbreaking way imaginable. But then, tragedy and disappointment were waiting for the Man of Steel from the first second he decided to see Krypton's death for himself. Even with the return of Booster Gold meaning he wouldn't make the trip alone. What he saw instead was even worse than his parents' death: he saw the wife, sister, and daughter who would have loved him. That isn't to say that the story of Superman ends up being a tragic one. Becoming a superhero is something special, and marrying Lois Lane ain't bad, either. As much trouble as his son Jonathan, the new Superboy may be, he's still a great kid. In hindsight, Booster gold may have actually been the smart one when telling Superman that nothing could be gained from time travel. Not only because it's his job to maintain stability of the time stream, but that witnessing a planet's death could ONLY mean badness. Superman did have a predictable wild, out of context reason (seeing whether his father Jor-El was really rescued as Krypton exploded). But when Superman and Booster Gold accidentally travel back into an alternate version of Krypton - one where it didn't explode. Since returning to Krypton means Superman's powers are completely removed, Booster manages to get his way. Hauling Superman back into his time craft and returning to their own future, the Man of Steel has no choice but to watch the last glimmers of possibility. Of his parents growing old, Jor-El and Lara Lor-Van achieving accolades and happiness. Of the daughter they had after Kal, giving him a long-lost sister. And of course, the wife and daughter that Kal-El would have had - becoming "the first family of Krypton." 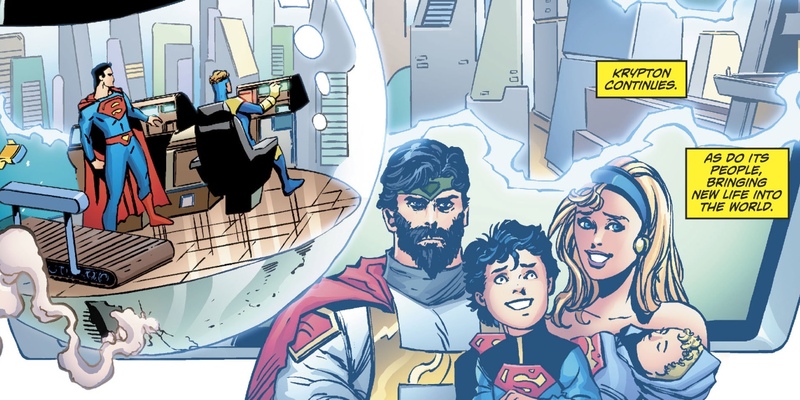 The happy ending/alternate life is aimed squarely at the longtime, sentimental Superman fans (a specialty of Dan Jurgens, who both writes and pencils this issue). And while some may put little weight on these scenes, since they were only ever 'possibilities,' other fans will sympathize with Superman's heartbreak (as happy as he is with his family... "the temptation is obvious"). Either way, seeing the return of the classic Kryptonian architecture and fashion is a thrill - and seeing Superman inserted into it as a member of Kryptonian society is an added bonus. Action Comics continues its march towards the coming Issue #1000, which is expected to be a particular treat for fans. But with April 2018 still so far away, a glimpse into the 'What If?' of the Man of Steel is a welcome appetizer. Action Comics #994 is available now.